The Cleveland Cavaliers’ LeBron James and the Golden State Warriors’ Stephen Curry during a game in 2009 in Cleveland. In the NBA, superstars command so much attention — and affect their teams’ fortunes so deeply relative to other sports — that it’s difficult to resist advertising a playoff series as Star A versus Star B, with teammates and coaches taking lesser billing. Sure enough, this year’s finals bout between the Golden State Warriors and Cleveland Cavaliers is already being touted as a struggle between Stephen Curry and LeBron James. That’s usually not a terrible prism through which to view things. Since 1985, the star — defined as the best player available to a team for the series in question, according to wins above replacement (WAR) during the regular season — with the better individual numbers1 in the playoff series itself has carried his team to victory about two-thirds of the time. In other words, as go the stars, very often so go their teams. But even if James outplays Curry, this series could land in the other third — with a Warriors win — because Golden State has such an edge in the supporting cast department. To judge the delicate balance between star power and sidekick strength, I used Basketball-Reference.com’s playoff data going back to 1985, looking at how much of any given series’s outcome can be explained by the quality2 of a team’s leading man and that of his supporting cast. According to relative importance, the difference in talent suiting up alongside each star in a series is roughly 2.2 times as important to the series result3 as the talent disparity between the stars themselves. How well does that mean James will need to play to offset the difference between his Cavs teammates and Curry’s Warriors? 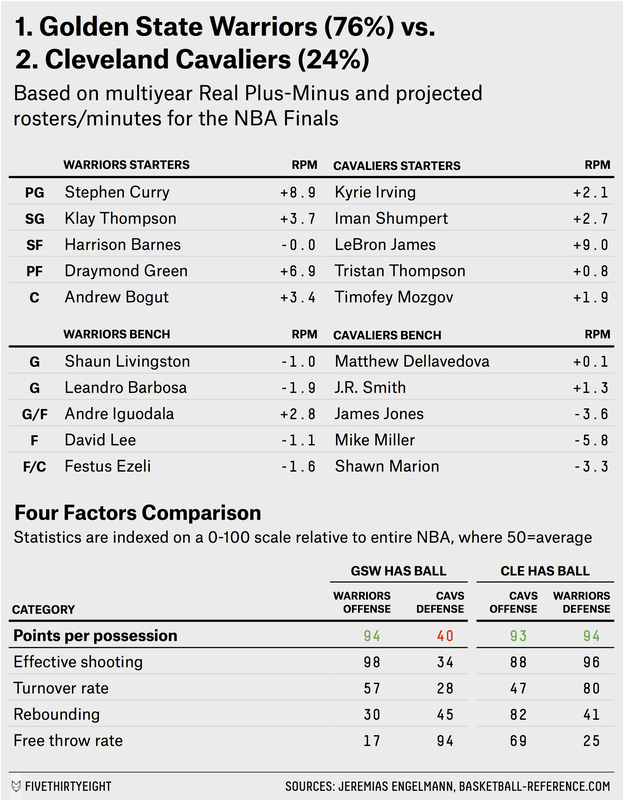 If each team followed the distribution of minutes used to generate our Real Plus-Minus series projection (see table above), James would need to put up numbers in the 99th percentile of all single-series star performances for Cleveland’s win probability to overcome the quality of Curry’s teammates and break even against Golden State. It’s a tall task, although one James is certainly capable of. Since 1985, he owns four of the 10 best star turns in a playoff series, all of which would be enough to help the Cavs topple the Warriors. (And that doesn’t even factor in the possibility that Curry could be held below his usual numbers, in which case a brilliant series from James would be even less necessary.) But it may well take an individual effort of that magnitude from James for Cleveland to snap its long pro sports title drought. As measured by leveraged points above replacement. According to a multiyear Statistical Plus/Minus talent projection. Including the margin of games by which the series was won or lost.